Mark your calendars because you're invited to this special Kendra Gives Back Party! Come out and enjoy sips, sweets, and jewels on Saturday, February 9th at Kendra Scott in North Hills from 1 PM until 4 PM! 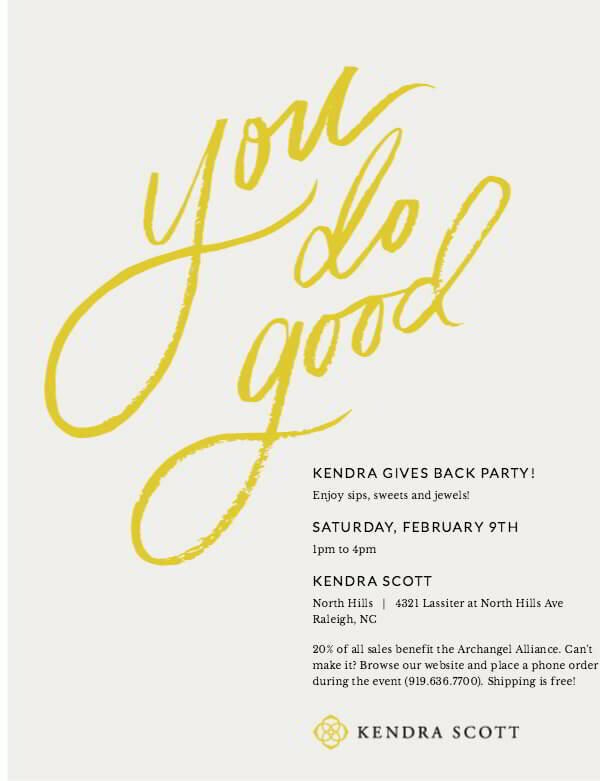 This is Archangel Alliance's third fundraiser with Kendra Scott and we are excited. Please plan to do some shopping to show your support for such a great non-profit organization, as 20% of all sales will benefit Archangel Alliance and go back to helping local veterans. If you can't make it, browse the Kendra Scott website at: https://www.kendrascott.com/ and place a phone order at (919) 636-7700 during the event. Shipping is free! Kendra Scott | Raleigh is located at 4321 Lassiter at North Hills Ave, STE F100 Raleigh, NC 27609.